What do the wise old Sage and the freedom loving Adventurer have in common? Capricorn is a sober, serious, responsible sign, whereas Sagittarius is reckless, unconventional and, at times, utterly irresponsible. Yet star sign compatibility is never as simple as it might seem, and this surprising pair can create a quirky and offbeat yet successful relationship, with a little effort. 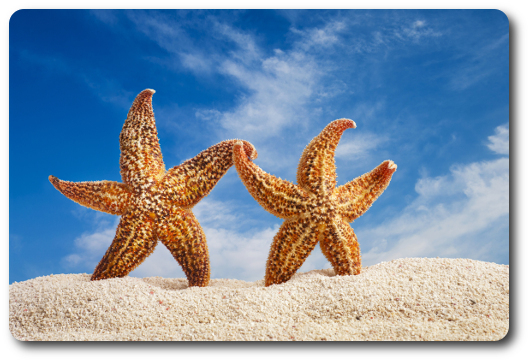 Capricorn and Sagittarius compatibility is one of those unlikely matches that can actually work out better than the more obvious sun sign partnerships. At first glance, the chances don’t look too good. When you look at the ruling planets of this couple’s signs, problems seem obvious. Capricorn is ruled by Saturn, the planet of restriction, responsibility, duty and other grown up and rather scary stuff. Sagittarius, on the other hand, is ruled by Jupiter, the bountiful, joyful, happy and generous planet, which gives Sagittarius a free spirit much like an eternal child. So how is that going to work? Well, fortunately for Capricorn and Sagittarius, compatibility is more than surface deep here. Yes, the couple do have very different outlooks on life, but in a funny way they each provide what the other needs most in life. Think about the mythological archetypes of these two: the Sage and the Adventurer. What Adventurer can make it through the story without advice and assistance from a Sage at some point? And what Sage, holed up in his or her village or cave (!) doesn’t yearn for a youthful Adventurer to guide and to shape? This couple can assist each other in their life purposes – provided they don’t dismiss each other out of hand first. Sometimes, the biggest problem for Capricorn and Sagittarius compatibility is getting the couple together in the first place. After all, Capricorn will turn up his or her snobbish nose at Sagittarius’ behaviour, while Sagittarius will take one look at Capricorn and think “boring”. You’ll know a little about these different personalities if you read horoscopes, and compatibility surely can’t flourish between such chalk and cheese couples….can it? Actually, when Cupid does strike, these partners will soon find plenty to interest one another. The Capricorn partner is drawn to Sagittarius’ fire and joie-de-vivre, whether they would openly admit so or not. And Sagittarius secretly admires Capricorn’s steadfastness and wisdom. This is a fire and earth partnership, so Sagittarius supplies the passion and Capricorn supplies the earthy sensuality – by the time the partnership progresses to the bedroom, this unlikely pairing could well be hooked on each other. For Capricorn and Sagittarius, compatibility comes as a surprise, but rather a joyful one. Essentially, both of these partners are on a journey, of sorts, and they recognise that in each other. The journey of the Adventurer Sagittarius is the more obvious, in their constant quest for knowledge and new horizons, but Capricorn too is on a journey towards their chosen ambitions, and supplies endless determination to get there too. In time, Sagittarius will come to rely upon the wise Sage for his or her step by step approach to problem solving and attaining objectives. In time, too, Capricorn will come to value the young Adventurer’s impulsiveness – who know, Sagittarius might even succeed in lightening Capricorn up a little. There may well be problems along the way, of course. The thing about horoscopes and compatibility is that sun signs alone are not a reliable guide to love. For a full, in-depth view of your relationship, try an Astromatcha astrology compatibility report, based upon both of your unique birth dates, times and places. In a nutshell, though, the issues to look out for in Capricorn and Sagittarius compatibility include a battle between the conventional and the rebellious, and another battle over family finances. The Sagittarius partner abhors convention and will want to do things differently “just because”, which can be deeply disturbing to staid, formal Capricorn. Meanwhile, Capricorn will spend a lifetime securing the financial side of things, only to have that blown in an instant by the Sagittarian partner’s reckless spending. These are very real issues that could spell the downfall of this partnership, and must be addressed. Do you have a question about Capricorn and Sagittarius compatibility? Ask our astrologer here or share your experiences of the dynamics of this relationship. The Sage and the Adventurer, with effort and patience, can take on the world – did you?